On behalf of Ulan Zalata organization, it is with great honor we inform you that Shanjin Lama of Kalmykia, Telo Tulku Rinpoche will be visiting us in the upcoming weekend. The welcoming event will take place on Saturday, February 2nd, 2013 from 3PM to 6PM at Pavilion Meeting Room at Best Western Gregory Hotel, 8315 4th Avenue, Brooklyn, New York 11209. Our organization has asked Telo Tulku Rinpoche for his patronage. 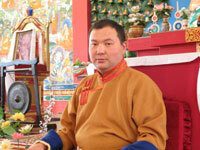 During his visit, he will be giving our organization refuge in 3 Jewels: Buddha, Dharma and Sangha. We also asked Telo Tulku Rinpoche to become our teacher. Refuge ritual is the beginner Buddhist’s step.Donations are greatly appreciated at that time. Suggested donation is $20.00 per person. All collected monies will cover meeting’s expenses and will be donated to the Kalmyk Khuruls’ Lamas that will take part in the ceremony.Volunteers for helping out with the event are greatly welcomed, please e-mail ulanzalata@yahoo.com for details. We hope that you will be able to join us for this very important meeting!